Our Vista-Dome features an 12 inch adjustable dome that protects the 8 1/2 inch tray. Feed your choice of bird feed without feeding squirrels or large birds. The tray and adjustable dome also allow you to make this a selective feeding station for meal worms, fruit treats and berries for Bluebirds and Wrens. A great way to enjoy more birds right outside your window. The deck rail clamp will adjust to fit your deck rail up to 4 inches. More coil attach feeding cups can be added as needed. 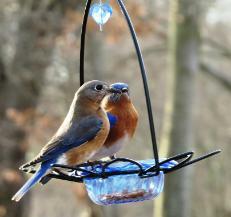 Here is an easy way to feed your bluebirds without feeding unwanted starlings. The 1 1/2 inch mesh wire will also protect the food from squirrels and robins. The protective roof lifts easily to add mealworms. Our most colorful Bluebird Feeder. 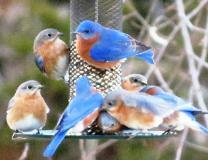 You will enjoy how the transperent blue cover highlights your bluebirds and brings out their beautiful color. Your new easy to use feeder is ready to post mount or hang. Make sure you place this feeder where you can see and experience the entire family of bluebirds every time they visit your yard. Find out more about the Missouri Bluebird Conference ! other species. Order it HERE!